Champions Community Foundation is pleased to announce its design partnership with the Georgia Tech College of Design with the express goal of making Champions Place the absolute best-in-class independent living environment for young adults with physical challenges. This alliance will utilize the latest research related to architectural Universal Design concepts as well as the best that current and future high technology assistive devices have to offer. We partnered with one of the College of Design research centers, CATEA, in the summer of 2016. Through CATEA we then connected with AMAC Research Center, the School of Architecture, and the Interactive Media Center's Aware Home Initiative. Georgia Tech students & professor meet with CCF developer. To apply the latest in Universal Design research directly to the architectural design of Champions Place and to create a best-in-class shared living environment that can be replicated and will allow young adults with physical challenges to live, socialize and work independently in their community. To identify and recommend currently available assistive technology tailored individually to each potential resident within Champions Place. To push the boundaries of state-of-the-art offerings and continually apply these technological solutions to Champions Place and to use Champions Place as a supportive living lab to further define the best that technology has to offer. The first phase of the partnership enlists the assistance of Michelle A. Rinehart, Ed.D., Associate Dean of Academic Affairs and Outreach, Jon A. Sanford, Director of the Center for Assistive Technology and Environmental Access (CETA), along with Yousef Bushehri, teaching assistant & Ph.D student. Under the direction of Dr. Rinehart, a group of undergraduate students in the School of Architecture are working to apply Universal Design concepts to the architectural design of Champions Place. The students' first assignment, entitled "Path of Resistance", was designed to jump start their empathy and understanding of the reality of living physically challenged. The class was divided into groups and each group was required to travel from a specific point A to a specific point B around the Georgia Tech campus and community in a wheelchair. As they traversed their path, the students were to document obstacles violating any of the seven (7) principals of "Universal Design". For example, a student pair was asked to travel from the Midtown MARTA station to the handicapped seats in the Bobby Dodd GT football stadium while documenting and filming all issues encountered along the way. A "get to know each other" lunch meeting was held at Tech providing the first opportunity for the design students to meet the young adults who might call Champions Place "home". 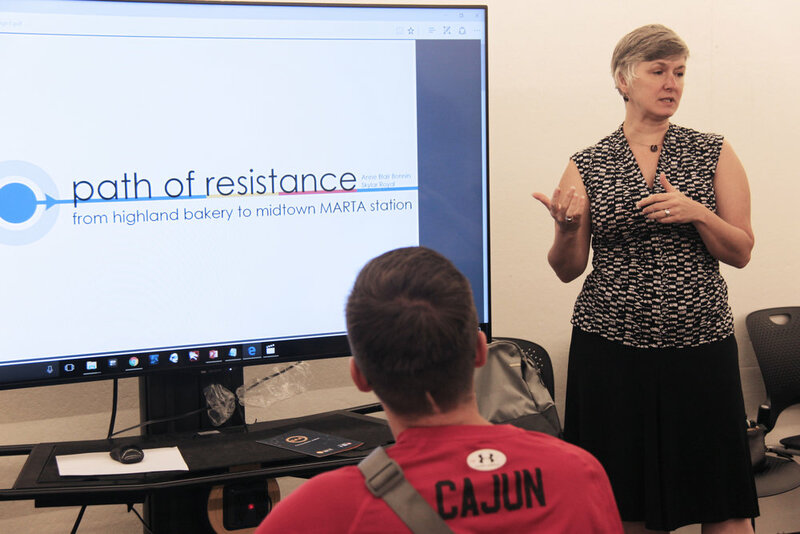 After lunch, each of the 4 student groups presented their findings from the "Path of Resistance" assignment. The design students and Dr. Rinehart traveled to Johns Creek to meet and ask questions of the Champions Place developer, Ed Pease, and to view the plot of land currently under contract with CCF. After reviewing the site and draft architectural plans, the students engaged with Ed and Rick Thompson, Board Chair, to discuss potential improvements the students could incorporate into their new designs. The group then traveled a short distance to the lot where Ed overviewed the work effort required to complete zoning and purchase of the land. To further develop the students' understanding of being physically challenged and create a bond between student and Titan, the Titans invited the design students and professors to attend one of the Titans' wheelchair sports scrimmages at the Mt. Pisgah UMC school gymnasium in Johns Creek, GA.
First, the students joined the Titans in their usual pre-game discussion. This discussion was based on John 14:1-3 where the Titans shared their feelings of both excitement and worry about moving into Champions Place. Afterwards, the students were quickly placed in chairs and soon fully engaged in wheelchair sports battle. Friendships, bonding and understanding continued to grow. The first scrimmage was so successful that the Georgia Tech team invited the Titans to scrimmage on campus. After a quick huddle to discuss Psalm 139:14, and each Titan's gifts and abilities, the students jumped in wheelchairs to join the Titans on court. Words cannot express how special the event was and how much it was enjoyed by all the Titans, coaches, volunteers, professor and students. Stay tuned for a summary of the students' mid-semester review with CCF staff, developer, builder, and architect on November 7, 2016.